Sir Knight of the Splendid Way is a captivating allegory - a rich literary masterpiece that will encourage any weary traveler. This beautifully bound work depicts life as a journey, reaching toward a beacon of hope in the City of the Great King. Beckoned by the King to travel the Splendid Way, the young knight must keep his armor on at all costs. All along the way he is tempted to take his armor off. Many try to convince him that the battle is worth the fight. But only those who keep their armor on can see the real battle that rages, and only those with a pure hearts will see the King. From Anonymous of Cleveland, Tennessee on 8/7/2018 . I love this book! It might be my favorite Lamplighter ever and one of my favorite books completely. The first time I read it I cried about five times. Sir Constant is such a good character and the King was portrayed beautifully. The ending was so breathtaking and moving and as a teenager, this book shows me valuable lessons as I walk the Splendid Way. I wish that everyone could read this book. From Shawlame Gorman of Oneida, New York on 7/12/2016 . This story is a beautiful illustration of the Lords undying love. It teaches us that whenever we fall, whenever we stumble, whenever we stray, He will still love us. And if we have faith in Him, He will always be there. May we all live in the City of the Great King forever! From Micah Risinger of Bremen, Indiana on 11/14/2013 . I loved this book! Thank you for putting in print another timeless piece of literature! 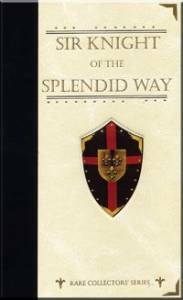 Sir Knight of the Splendid Way is a exciting book that reflects many important Scriptural truths, and I took away a lot from it. This book in many ways will help you meditate on the Christian journey of faith in the Lord Jesus Christ. From Audrey Layman of Dayton, Virginia on 10/5/2013 . I have always enjoyed allegories and felt that this is the best one yet! It so accurately portrays the spiritual battle that we are all in. I have read this over and over and still gain new inspiration from it each time! Keep up the good work of providing wholesome literature! From Anonymous of Lubbock, Texas on 7/1/2013 .